Why Toy Story 3 deserves Best Picture…but won’t get it. First, let me admit to being late to the game. I’ve only JUST seen Toy Story 3. For months I’ve had to avoid spoilers. My friends, having grown up with the series like myself, had all seen and loved the film, and were anxious to talk about it. But I plugged my ears and carried on, somehow missing out on every opportunity to see the film until I Netflixed it. I honestly believe that Toy Story 3 is one of the best films to have been released this past Oscar year. No, I haven’t seen all the pictures rumored to be Best Picture contenders, but I certainly feel confident enough to make a case for Toy Story 3. Critics predict that TS3 will most definitely get a nom, most likely even a Best Picture nomination due to the increased category sizes (10). Yet, critics also overwhelming agree that the chances of TS3 WINNING Best Picture are slim to none. Their most definite lose in the category is not due to any deficiency in quality, but rather it can be pinpointed to the simple fact that TS3 is a “kids’ movie.” Yes, TS3 is quite obviously labeled a “family film,” “child-friendly,” “fun for the whole family”– but what the average viewer fails to understand is that TS3 is much, much more. Let’s first look at the reasons why TS3 should win Best Picture. As the Oscars website says, the golden statue is symbolic of “superior achievement…Although it measures just 13½ inches high, the Oscar statuette stands tall as the motion picture industry’s greatest honor. Officially named the Academy Award of Merit, the Oscar is given in recognition of the highest level of achievement in moviemaking.” So how do you judge the quality of “moviemaking”? Well, for the purpose of this write-up, and seeing as I’m no expert movie critic, I will explain my argument based upon my own beliefs in what makes a good movie good. The Cast/Acting: As a cartoon (which, by the way, is a major strike against TS3’s winning Best Picture) we clearly do not see the actors portraying the characters, but a quick view of the cast list reveals a myriad of seasoned veterans in the film industry, led by the admirable Tom Hanks. Other voice talents include those of Tim Allen, Joan Cusack, Don Rickles, Michael Keaton, Whoopi Goldberg, Timothy Dalton, and John Ratzenberger (whose voice “appears” in EVERY Pixar film). The award count, both of nominations and wins, amongst this group is too great to cover. Okay, so clearly the cast is of film history, but further proof of their absolute talent is the impact the characters they have created have had on multiple generations. At 21, I grew up with the series and could name any of the toys. My parents, of the baby boomer generation, could also name any of the toys, because let’s face it– parents want to watch this movies as much as their kids do. I work at a daycare (ironic when looked at in reference to the film’s content), and I know the range of children who come in who can also name these characters. From the two-year old who cries for the Woody doll every time he comes in, to the 8-year-old who (maybe a bit begrudgingly) admits to wanting to play with Buzz. The characters have spanned generations, and are loved by each and every one of them. The Script: Something I particularly noticed about the “human” dialogue was how believe it was, possibly because I can recall having the exact same conversations within the past couple of years (the mother’s reaction to her sons emptied out room/son going away? Yea, I’m pretty sure they snuck into my house for that one). Of course, the witticisms of the toys are beyond hilarious– and intelligent. From Lotso’s silly sigh of “F.A.O. my Schwartz!” to Bonnie’s toys informing Woody that they “do a lot of improve,” I was laughing almost throughout the film. I possibly mistakenly chose to watch this film with my mom who is a notoriously loud laugher and due to her constant cracking up, there were multiple occasions when I had to rewind a bit to hear some dialogue we might have missed. And it’s also heartwarming, as are several of the moments in the movie. The Storyline: I will begin this part by stating how frightening I found particular scenes to be in this movie (fire burning at the dump!! My stomach was in my throat). Overall, the story was phenomenal. The plot was perfect and went right along with the other two movies, as well as remained relatable to viewers– Andy ages and goes to college, I’ve aged and gone to college…are my toys mad at me? The story also had everything drama (moving on to another chapter in one’s life, letting going of the past), humor (mentioned above), adventure (an escape to rival Ocean’s 11 or Shawshank Redemption), horror (once again, dumpster and fire), romance (Jesse & Buzz, sitting in a tree…Oh, and whose heart didn’t break when it was revealed the Bo Peep had gone on to a new kid? ), and…foreign influence (Yo quiero Espana Buzz). The Appeal: I’ve already mentioned this various times throughout this post, but there is no denying the widespread appeal of this sort of movie. A greater audience will be able to enjoy this film–to laugh with it, to cry with it–than any of the other contenders. This movie does the practically impossible by defying age boundaries. At the box office, most adults went with children, but I know a great deal more who went on their own. I know grown men who admitted to bawling like a baby at the movie. I know children who call this film their favorite, as well as adults. Critics loved the film, not just for children, but for themselves. 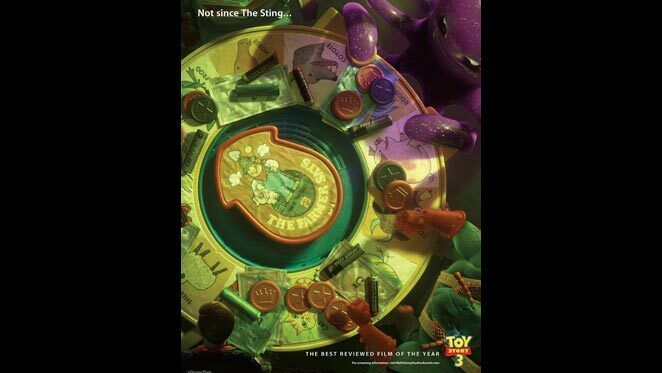 The Toy Story franchise in general has a vast appeal that nearly no other movie has, or will ever have. In an earlier post I mentioned the unique campaign Pixar was running for TS3’s consideration in the award season race. 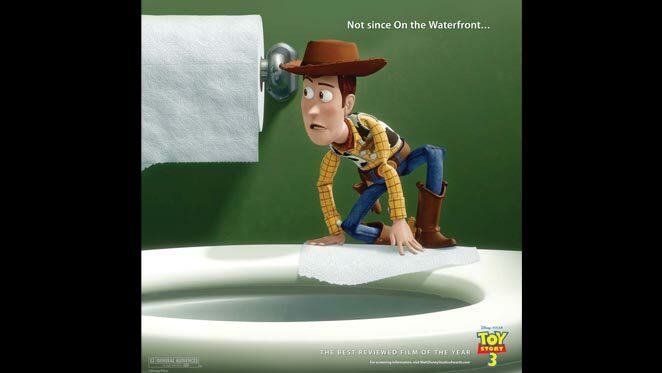 It is the clever and brilliant ideas such as that can be found throughout the whole Toy Story franchise. And yet, it’s a cartoon. It’s a Disney cartoon. While the Academy members who vote are certainly more able to appreciate the film’s genius than the general population, there is still a certain taboo to the idea of a cartoon (actually, computer animated) becoming the Best Picture. After all, an animated film isn’t suppose to be though-provoking, deep, emotional, moving, AND entertaining. That would just be preposterous…right? Honestly, I can’t rave about TS3 enough. But, then again, this is only one person’s opinion. I would love to know how others felt about it– Sound off below? It’s Oscar season, and any movie that was any movie is asking for the academy’s “consideration.” While some campaigns are less organized, such as Justin Timberlake’s personal crusade to gain The Social Network some Oscar glory, Disney has once again pushed the envelope. Animated films, no matter how amazing, are often overlooked in the Best Picture category. Only twice before have animated films been even considered for the honor– Beauty and the Beast (’97?) and last year’s Up. But Disney’s Toy Story 3 refuses to be ignored. 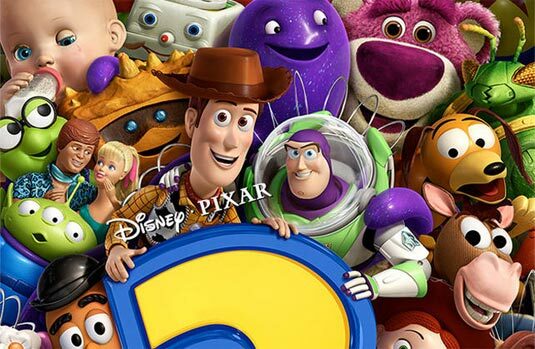 To combat the often neglectful eye of the academy, Disney is running what appears to be an ingenious campaign for Toy Story 3 in an attempt to be considered as a Best Picture nominee. The website is featured below, and I’ve attached a few pictures to this post. Really, the photos are worth a look…and consideration (whether you’re from the academy or not).